Sometimes it becomes necessary to Soft Reset, Hard Reset Nokia device. But doing Hard or Soft reset on Nokia can erase the contents of your phone and return to original configuration, so therefore if you are going to Hard or Soft reset your device then make sure to take backup of your Data. 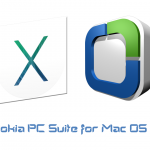 To take backup of your phone you can use Nokia Suite (also known as OVI suite). If you are not having PC then you can backup your files on the external memory card. Once you have taken backup on memory card then remove it before processing Hard or Soft reset. If you are having MAC computer then it will be better to use iSync to sync all your data like contacts, calendar, settings. The soft reset will not erase your data, it will simply restore all factory settings. You must then configure everything. It is recommended to take backup of your data Before before processing Soft reset, including your contacts and calendar entries. To do a soft reset, the phone must Be functional. 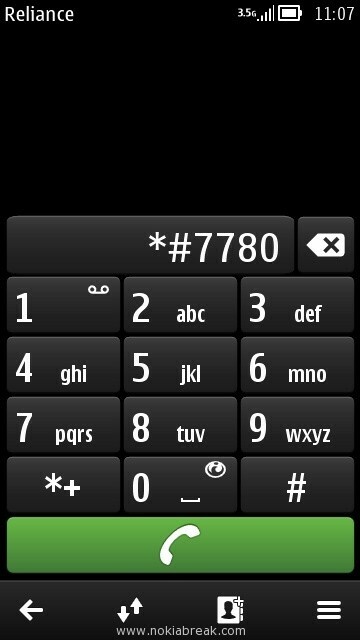 Open Phone dialer and type: *#7780#. It will popup a dialog box Saying “Factory settings will be restored. 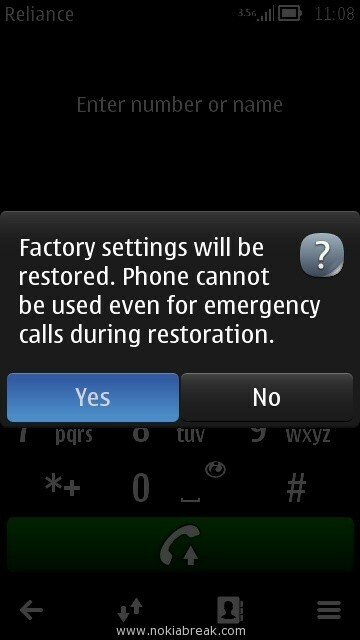 Phone cannot be used even for emergency calls during restoration”. Tap on the Yes button. 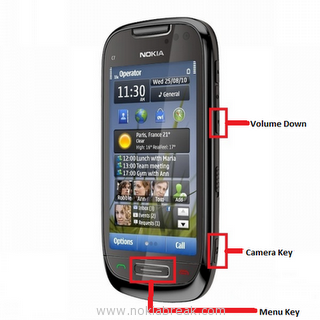 Now you have to enter the Phone Lock code (default code for all Nokia phone is 12345). Your Phone will be restarted and settings will be restored. The Hard reset will erase all the data on the internal memory and it also restores the factory settings of your Phone. In Hard reset the files on mass storage Will not be affected, but it will be safe to have backup. To do a Hard reset, the phone must Be functional. Open Phone dialer and type: *#7370#. 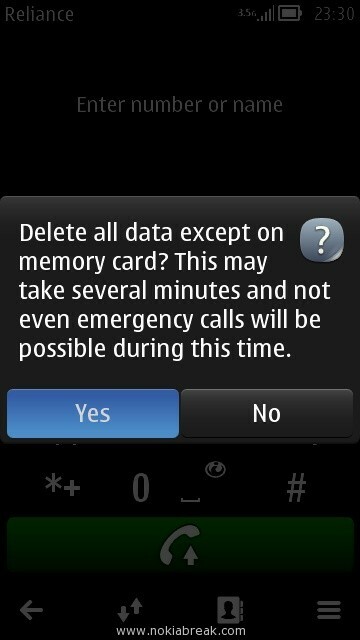 It will popup a dialog box Saying “Delete all data except on memory card? This may take several minutes and not even emergency calls will be possible during this time”. Tap on the Yes button. If you are unable to Hard reset from the above procedure or your Phone is not functioning properly, then you can follow this procedure. 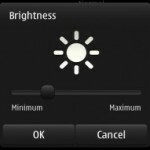 Press Volume Down + Camera + Menu button at the same time for 8 seconds. It will Hard reset your Phone, and may takes several minutes to restart your Phone. You can try the last method of Hard resting your Phone, on v3 or v5th editions of Nokia Phone. If you got any problem while doing the above steps then you can contact use using the contact form below. 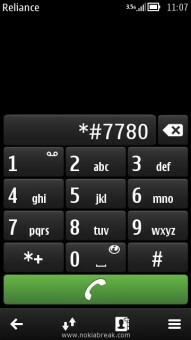 Hello, I have a Nokia 700 and I tried to perform a hard reset by entering the code *#7370#. The warning message showed up and I clicked “YES” but I didn’t have the time to enter the whole security code and I only entered 123. Then the phone switched off, and no it cannot be switched back on again. The only thing that is comming up is the NOKIA logo and then a black screen again. Several times I saw 3 colorful stripes going through the length of the screen. I tried holding the volume down+unlock+camera+reject button, as well as volume down+camera+menu button. The outcome is the same, the phone tried to boot, but cannot go past the NOKIA logo. I hope you can help me and I am looking forward to your reply. @ Stoycho Pampov, If you have entered the incomplete password and that code is accepted by your phone, then there is problem in the phone software. As you said your phone is only showing the Nokia Logo, this error generally occur when software is corrupted. All you can do is to take your Phone to Nokia Service Centre. My Nokia N8 went offline and it is not allowing me to switch it to any other profile. Tried with other sim cards but issue persist. Hi, I have installed Nokia Belle on N8. Can i reinstall this OS again like we do in Computers whatever might be the reason it is for reinstall? Instead of re-installing you should prefer hard resting your Nokia phone. You can also take your Phone to the nearest Nokia service centre to re-install the OS again. i have a nokia x3-00, i typed in *#7370# and nothing happens, it says result unknown, how do i do a hard reset with this phone? This code doesn’t work in java phones..
can u help me patel. worked for me – on a C7 running S.Belle. Hi, my N8 (Belle refresh) switches on only up to the home screen, then none of the widgets appear, just the wallpaper, network & battery status. This happens for about three seconds. Then it restarts twice with the same results. Then it finally switches off. I tried the “three finger” hard reset= volume down + camera button + menu button, but it doesn’t work. I have been thinking of flashing the phone with phoenix but it won’t stay on so pheonix doesn’t detect it. Should I flash it as a “bricked” or dead phone? No better first you do hard reset and then reinstall the phone software..
Hi, did you fixed your N8? How! I have a nokia C7, and I must if I can reinstaling the original S3 on him, without any update! Can you give me more details? I have a Nokia E6-00. The default Password is 12345 for all nokia phones. i have a Nokia 3110c phone which is dead now(firmware corrupted) is it possible to hard reset in this state? Would you helping me please. My proximity sensor also not working……………. always my mobile automatically locking when ever I gt a call r msg . I have nokia 700 handset I forgot the security code can you tell me how I can reset the phone. i have belle installed in my nokia c7-00…. 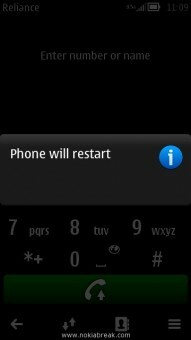 after hard reset, will belle be retained or it will be back to symbian v^3 ?? I got a problem on the vedio and photo editor application after I upgrading my nokia N8-00 original software to nokia belle!!! What can I do to solve this problem? Hi, I hard reset my n8 but after that i lost foto editing option in gallery, and other prob. is that this device shut down automatically when i connect to pc, and hangs very often. man! i got nokia e-5 and i cant delete my image files in internal . and they are corrupted…. 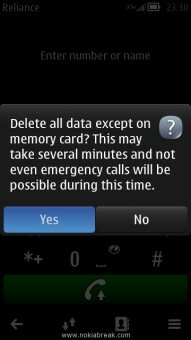 when ever i click on delete my handset shows GENERAL: SYSTEM ERROR!! i showed it in nokia care! bt dey failed!! can u give some sollution?? but its not working given error, incorrect password ..so you please help me how to reset my phone..
my nokia 808 the led light for video recording doesn’t turn on, help me please!! thanks! My Nokia, N8-00 (simlock free), recently started rejecting other simcards except for one currently inserted. Could you please assist as I travel a lot and end up having problems of carrying a second handset. how to change 808 software is their any hope…….? how to change 808 software is their any hope…….? i want to android in that pls help me…..
i am using nokia n8.it is not allowing me to use internal memory it is showing memory card in use. i did hard reset my nokia c7…. the mobile network is not working…but the net connection is working on other mobiles and even on connectin my mobile with my laptop..
01 Sir My Nokia C7-00 Anna Bells Upgrade How to Anna Bells Remove . i have nokia c7 and one day when i woke up and saw my phone was automatically off when i switched it on my whole gallery was empty. What should i do i have other backup it contains all my wedding pictures. Please I need help with my Nokia 808 urgently. Sometime last year, I changed the “mobile security” password and now, I popped in my new Sim card and it requires d password to be able to access the phone. Please any way I can bypass this damn software or recover it using my email address? Adwords. Anyway I’m adding this RSS to my e-mail and could look out for a lot more of your respective exciting content. Thanks for finally talking about > How to Soft Reset, Hard Reset Nokia Belle, Anna, Symbian < Loved it! reason appeared to be on the web the easiest thing to have in mind of. I’ve nokia 808, Forget the passward & 12345 is not work so how to hard reset my phone. the reason that i want enjoyment, since this this website conations truly good funny information too. Hi, I’ve nokia 808, Forget the password and 12345 is not work so how to hard reset my phone. Please details send in mail I’d..
My Nokia 701 internal memory has been crash.All data stored in the phone memory is deleted and No Internal storage is showing.Phone become too slow after this. What would you suggest about yoyr post thatt you made some days in the past? found this wweb page as a finest web site for most recent updates. This is my first timee pay a visit at here and i am actually pleassant to read everthing at alne place. in writing this blog. I reallyy hope to see the same high-grade blog posts from you later on as well. New Caney Tx! Just wanted to mention keep up the exceloent job! Do you know how to make your site mobile friendly? My weblog looks weird when viewqing from my apple iphone. I’m trying to find a theme or plugin that might bee able to correct this problem. If you have anny recommendations, please share. Cheers! You realize so much its almost tough to argue with youu (not that I personally will need to…HaHa). You definitely put a brand new spin on a topic which has been discussed foor decades. certainl like yopur webseite however you have to test the spelling on quite a ffew of your posts. I lost my Nokia C7 . I connected it to PC Suite and synchronized it . Is it possible to collect all my data and contacts/messages from Nokia PC suite. Now I have purchased Nokia Lumia 800 and when I conected it to my pc , it show a message to download a new software for Lumia 800 window phone . I download this software and again connected the phone , it synchronized … But it didn’t recover the data /contacts/messages which were already saved in Nokia PC Suite . Please help me . what is the solution to recover my contacts/messages/data and transfer to my Nokia Lumia 800 (window phone) . pls i ungraded my nokia e 6 anna to belle but cant find my photo editor and other few software. What can i do 2 get them back. pls i ungraded my nokia e 6 anna to belle, how can i reinstall my phone back to nokia anna. hi , I have a nokia 700 been updated into belle fP1 but can I take it back into symbian OS ? I lost the password but i have try the 12345 code for Nokia but still cannot access the phone. What is the advice? Your post is Very informative. I have benefited from your nice post. So I like your mobile hard reset tips. I have nokia 500. The problem is that its touch is not working and i want to perform a har reset on it. Can anyone tell me a solution to this. hello, i have NOKIA 701, the problem while using is, i installed whats app in my phone, but after complete installation, it show, correct your phone date and time, then i corrected by actual date and time, even though its not working, again it showing the same message, then i apply to reset my phone by dialing *#7780# and the password 12345, so my phone gets restarted and i thought maybe it’s been cleared, but no, its just showing again the same message, so i request you tell me how do i get out from it, how i just clear that error in my phone! I follow the steps and its working to reset Nokia ! 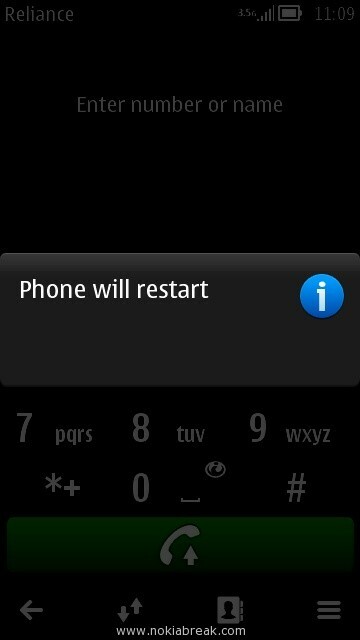 I have a nokia E6… I accidently switched it off and then when it opened it requires lock code tough I never activated.. I tried the default one too but it wasn’t working too…. So any Help I can get here?? i cant open any application on my nokia c7 even my menu list. And if i click the menu button “System error” keeps flashing on my screen. Hoping for help. Thank you! When I power on my Nokia N8 Symbian I don’t see 2 shaking hands, all I see is loading bits in the middle then after that security code comes out, the problem is I don’t remember my code and iv’e tried soft and hard reset but still the same. PLEASE kindly help me whoever knows how should I do. hello.. i have Nokia pureview 808 and i forgot the security code..i have tried all the methods above but nothing works.. it keeps telling me to enter the security code/code error.. without unlocking the security code, i cannot get access to my phone.. please help me..